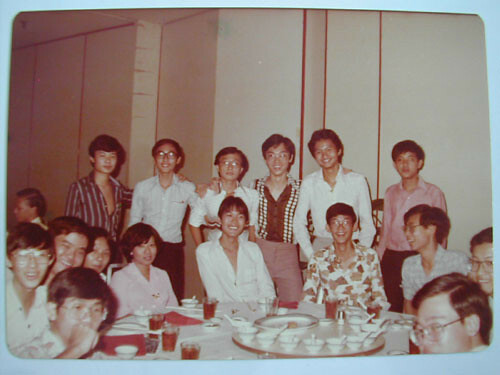 It didn’t occur to me until I go thru my old secondary class photos that it was still in Black and White print when I was in Sec.1 (1975). This one was taken outside the classroom facing the school field. See those doors behind us, there were about 8 of them in each class (think it’s 4 on each side). 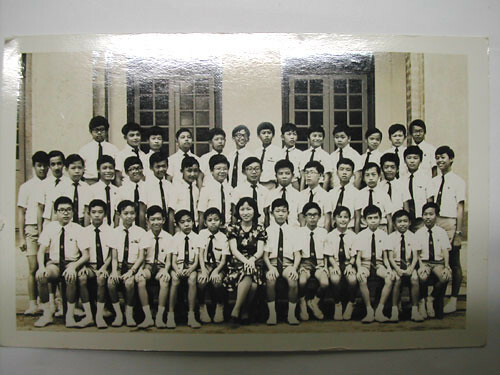 It took me quite some time to accustom to the Sec.1 school life as all of us came from different Primary Schools. 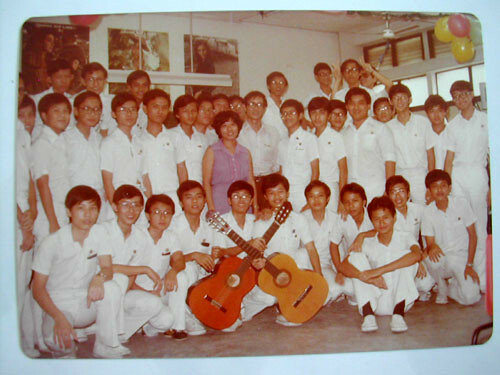 Of course my form teacher (below photo) was Ms Lim then. 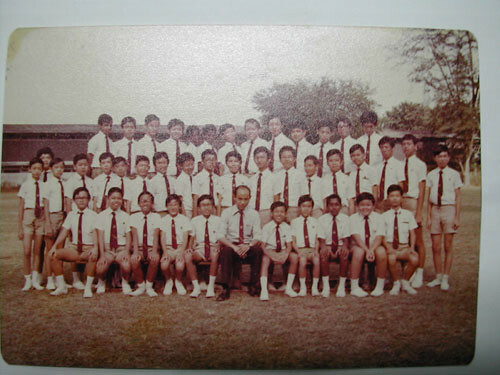 My class was Sec.1G. Streaming was at end of Sec.2 and I had chosen to go to Technical stream. There were Science , Technical and Art Stream during my time. 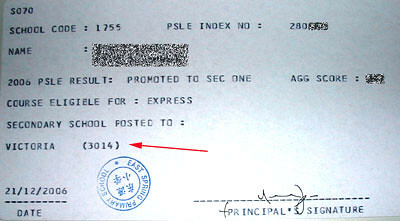 Though my results allowed me to go to Science stream, I didn’t want to as I wanted to go Poly (S’pore Polytechnic). This was my Sec. 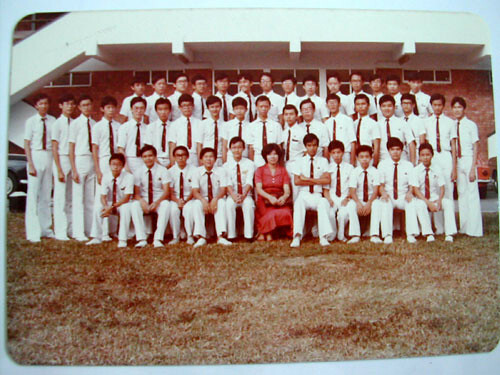 4 class photo and my form teacher was Mrs.Lee. I was in Sec.4T1 (T for Technical, A for Arts and S for Science stream) then. Mrs.Lee is the only teacher who is still in Victoria School now as she is my son Larger HOD (Head of Department). As you can see from the photo below, we were wearing long white pants finally. At that time, only Sec.4 were allowed to wear long pants, while Sec.1 to Sec.3 were to wear the Khaki brown shorts. 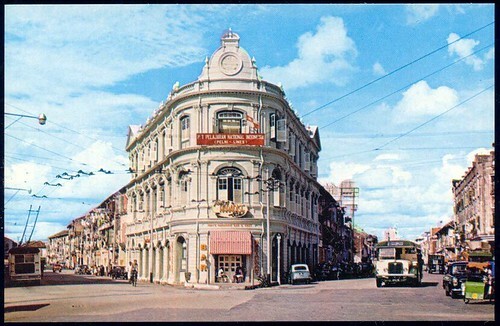 Some of us had been to her house at Marine Parade. As it’s our final year there in Victoria, our relationship with our form teacher was rather close. In the above photo, you can see we were allowed to paste some posters on the back wall for decoration. Oh I remember Victor (a fellow blogger) was also from Victoria as he did blogged about in his blog. Yes, Mr.Mok and Bulldog were among those popular figures then. Though Mr.Mok was very strict, he was nevertheless a very good Additional Maths teacher. There was another teacher whose nicknamed “Stoner” taught us English in Sec.4. Our whole class hated him as he was one of those teachers on the “Wanted List”. One day, he was rocking his chair with his leg pushing his table until he fell off it. The class laughed and we had our ‘revenge’. Also I remember almost half of our class went to a School at Queenstown to take our Highway Code test together. Of course I passed mine at the first attempt! See our fashion sense then haha. Sorry I can’t remember what we had for dinner that night, anyone? 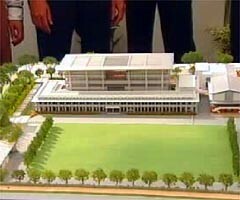 When I heard the news of the Ground Breaking ceremony of the People’s Assocation New HQ on 20 January 23007 at Victoria School Tyrwhitt Road, I felt sad. I knew I was again late to catch a few last glimpse of my Alma Matar. Well it’s kinda like new building over old building…not too sure which part of the old building are they going to retain. 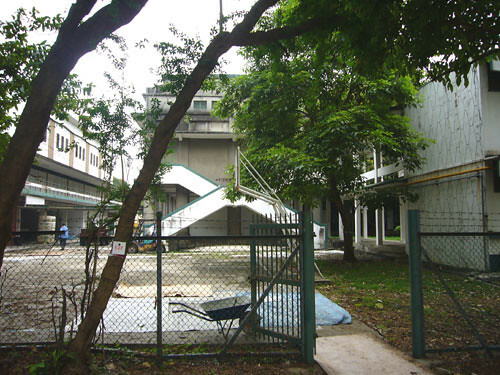 Here are some photos of how the school like in February 2007. The main gate where the School Hall was on the right side. The contractors there probably wondering why am I such a slow hand to come here and take photos haha. 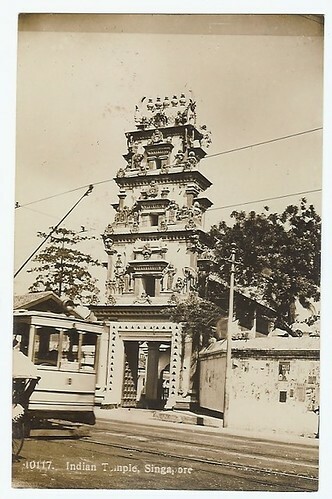 Seems like the main gate had been changed since then. 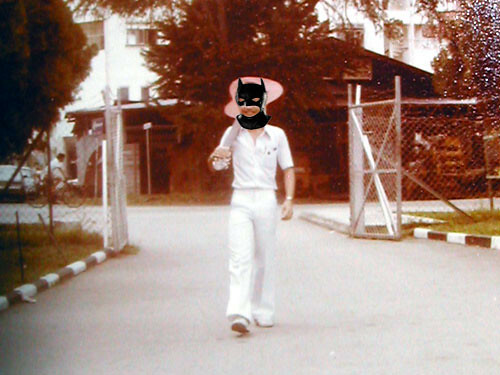 You may see the photo below (1978) of me carrying a guitar entering the school main gate. Even the building outside the school had changed. The main building block is just besides the school field. Many of us like to peek at the game whenever there was a football match going on, so doors nearest to the field were usually “ordered” to close. 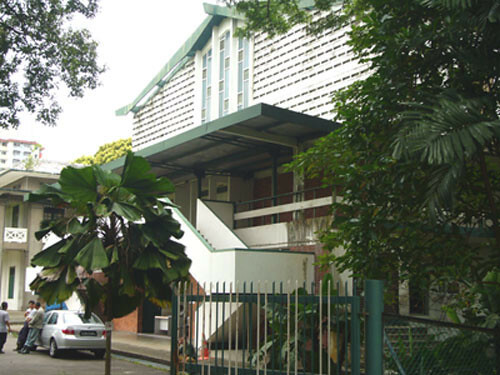 The building on the left below was the School Hall and below it was the Canteen (Tuckshop – we used to call). 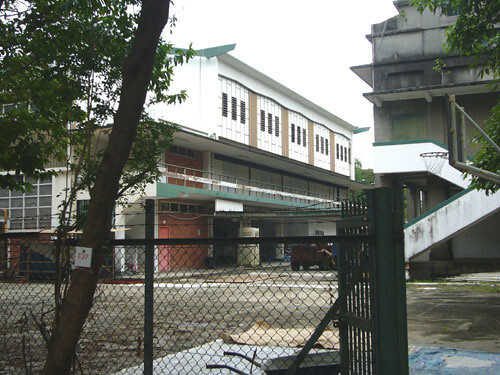 Though now the building on the right (below photo) seems old, but during my time, it was called the New Block. My classmate Johnny and I loved to stroll along this new block. The library was at the second and third floor of the centre building shown in the photo. The basket ball court was a popular place for the basket ball players and plastic ball footballers too. What is not shown in the above photos, was the canteen was turned into a temporary carpark for the contractors! 2 choices at my time compared to the my son’s last year 6 choices – a very drastic change. 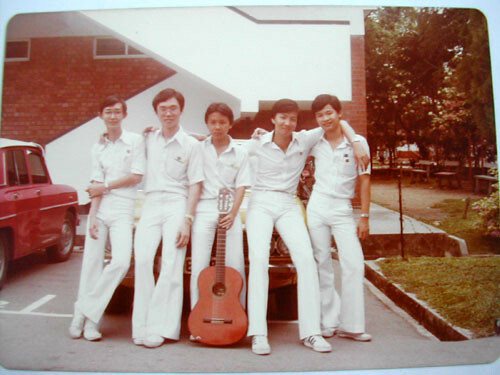 Yes, we both ended up in the same Secondary school – Victoria School, but different premises. 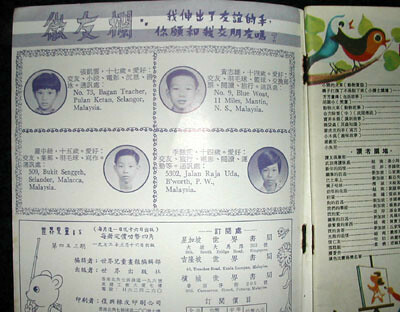 Even my father studied Japanese language at Victoria School (then renamed Jalan Besar Boys’ School) during the Japanese Occupation period. My father told me that he was around Primary School age during the Japanese Occupation, so what he could recalled may be limited. 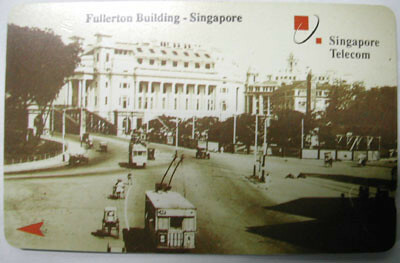 The above shows the building plan of the old Victoria School during the Japanese Occupation. 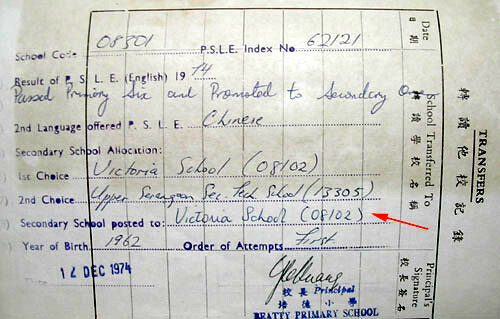 “1” was occupied by Kwong Fook Chinese School students where Chinese language were taught secretly. “2” was occupied by the ‘Victoria School’ students where Japanese Language was taught. “3” was occupied by Tamil students where Tamil was taught. So basically during the Japanese Occupation, it was actually occupied by 3 different schools. Sad to say that my father only studied there for about 1yr plus and thereafter he left to work in a Japanese factory. 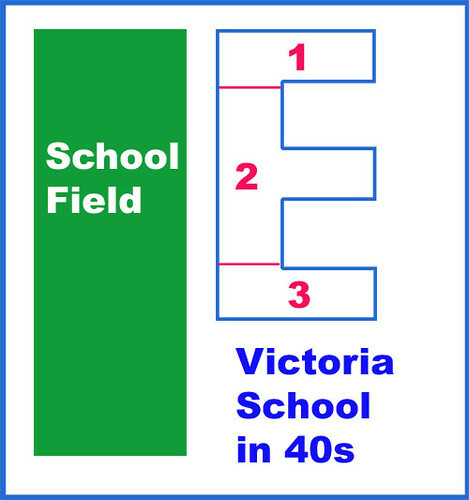 Yes both my father and I went to the same school too (same location – Tyrwhitt Road) and that’s Victoria School. So it’s the same School for us 3 Generations – My Father, Myself and My Son. 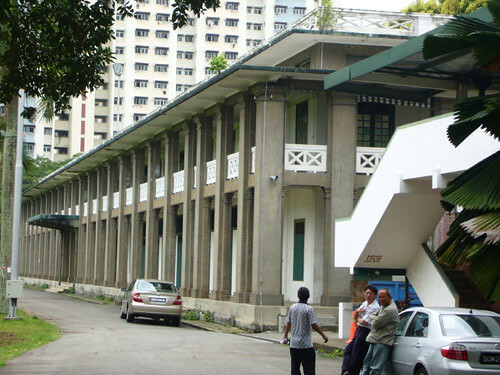 Victoria School is among the oldest schools in Singapore – 131 years old. Here is the History of Victoria School. I remember when I was young, we used to talk about MSA then MAS and SIA. So what’s all these talk about? Nothing much but just some history of SIA. 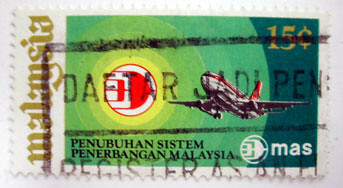 Well that MAS stamp was issued in 1973 if I’m not wrong – How Time Flies…I was 11yrs old then and in Pri. 5! 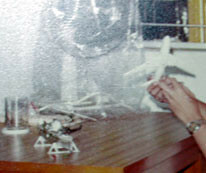 During the 70s, plastic modeling was my best hobby. Brands like Airfix and Tamiya are very popular then. Fixing of airplane was my favourite. Of course, at that time I couldn’t afford a airbrush and compressor, so most of my models are uncolored. 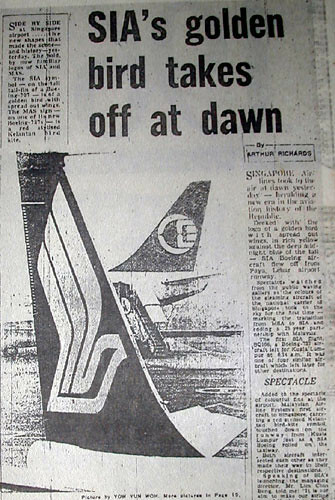 Here is a photo of the Malayan Airways plane (a Douglas DC-3) at Paya Lebar Airport in 1959 . 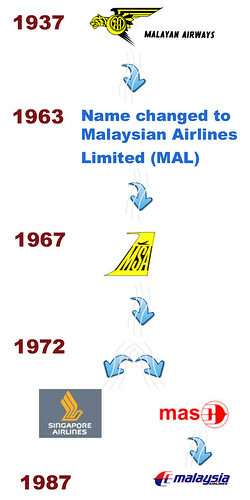 So who still remember the Concorde between 1977 and 1980? 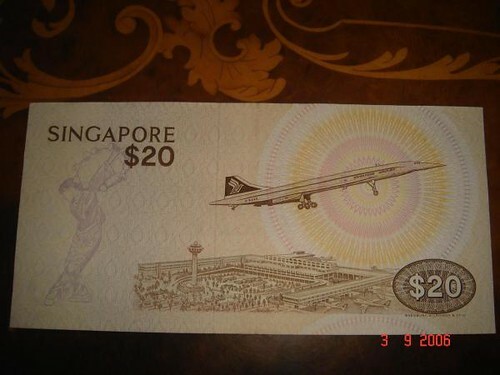 The note was first issued in 1979. 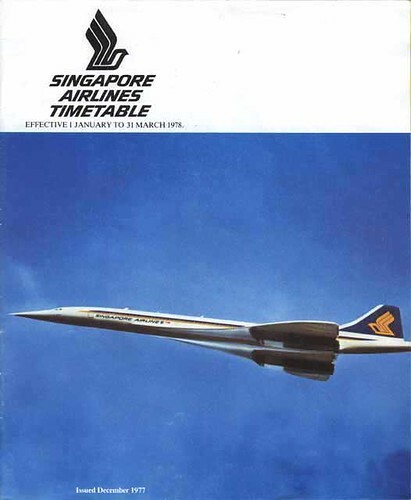 I was so excited when the Concorde made her maiden flight to Singapore then. Though the sound made by that bird was tremendous, but the sight of that plane was very impressive! 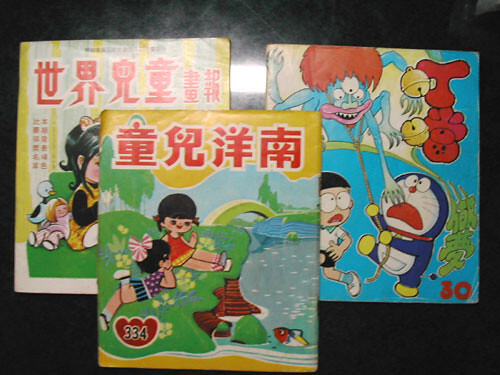 I love to read them when I was in Primary School (60s and 70s). 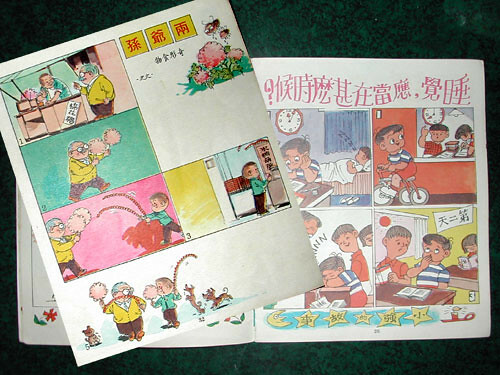 The above are some of it though they are Chinese Publication. See – Doraemon already exits at that time! Actually what attracted me to reading them are not only they have interesting comics but also good compositions submitted by the students themselves. Of course with email nowadays, who still post a letter to your penpal? As for the English Publication, my first choice is definitely Student World! Oh, I didn’t keep a copy of it at all……sigh…… I remember I used to win some money ($5 maybe) for the coloring contest organised by the Student World magazine. How I wish someone still have a copy of it and email me the photo of the cover. 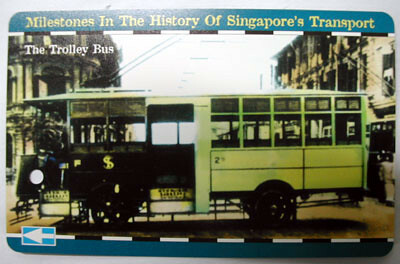 – Amalgamated Bus Company (West Route) Formed by Hock Lee Amalgamated Bus Company, Keppel Bus Company, Kg Bahru Bus Service. 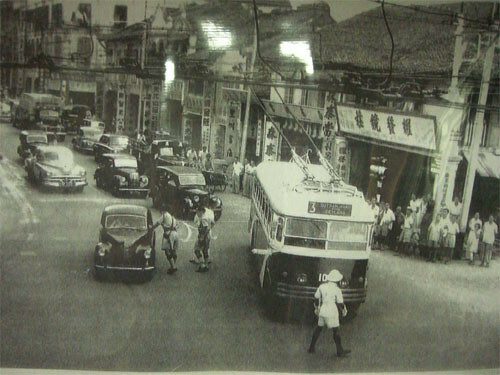 – Associated Bus Services (East Route) Formed by Paya Lebar Bus Service, Changi Bus Company, Katong-Bedok Bus Service, Ponggol Bus Service. 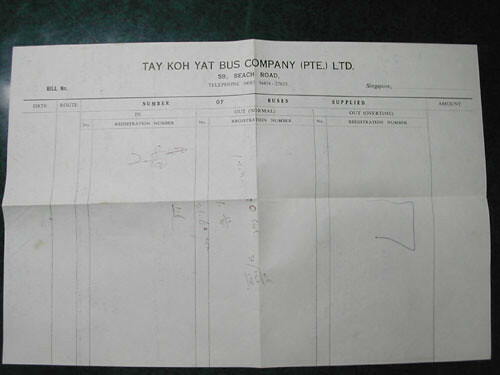 – United Bus Company (North) Formed by Tay Koh Yat Bus Company, Green Bus Company, Easy Bus Company. 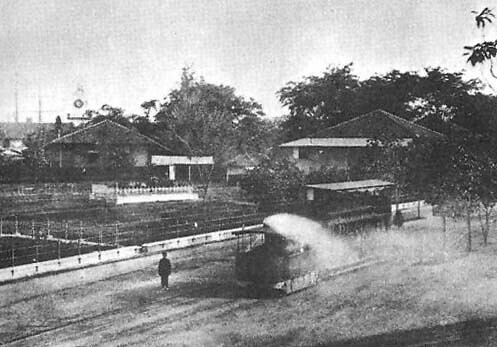 – Singapore Traction Company (STC) was to maintain its operation in the Town Area. 1973 : STC went burst. 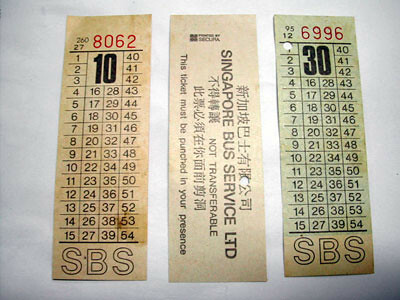 Government step in to bring the 3 bus companies together; Singapore Bus Service (SBS) formed. 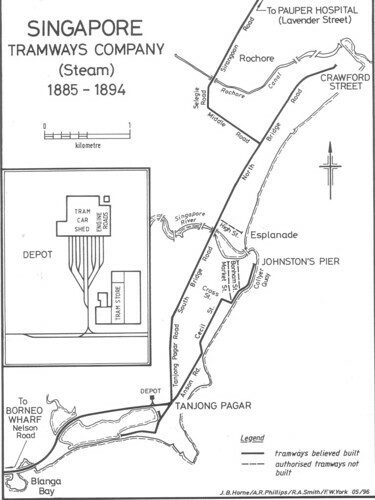 Here is a very good site about Steam and Electric Tramway in Singapore from Malcom. 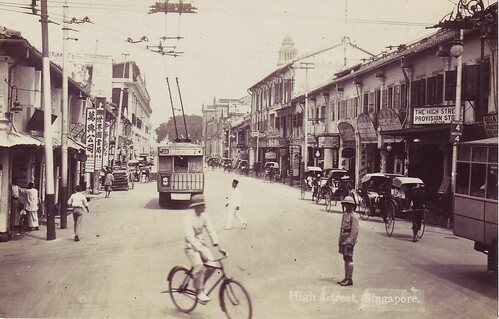 Let’s see some Trolley Buses in the olden times Singapore. See if you can tell the differences between Electric Tram and Trolley Bus? – Trams have flanged wheels and run on rails or grooved tracks. 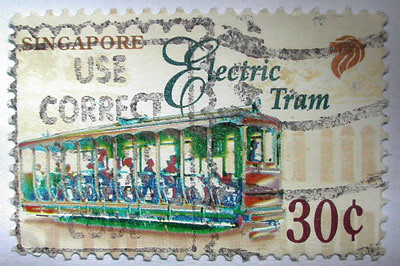 Trams take electric power from a single overhead wire and the return is from the track. 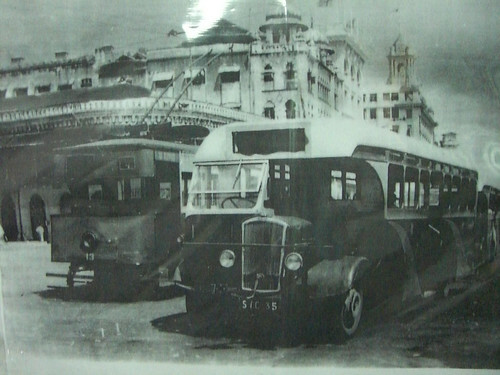 – Trolley buses have rubber tyres and don’t run on track or rail. They take power from a pair (2) of overhead parallel wire. Maybe they may be fun and interesting to look at now, but I for sure don’t think I will enjoy the ride at all. When I was surfing one of those online auction site, I came across the above. 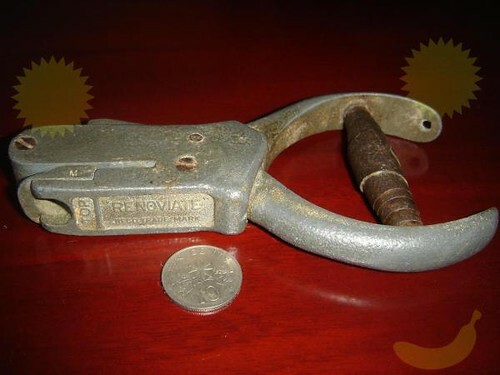 Yes, it’s like one of those bus ticket hole puncher used by the bus conductors. Well these are probably the only 3 tickets left in my possession – somehow hidden inside one of those old textbooks! I hate taking buses not only in the past but even now! I hated those bus conductors who shouted right at my ears and pushing their way from front to back and back to front. I hated those bus drivers who brake and accelerate, accelerate and brake every few seconds. I hated myself for being unable to balance myself on the bus. So I never like taking bus. 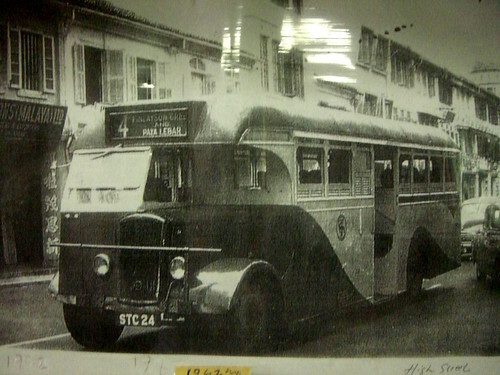 During my time 60s and 70s, I think I still find the STC buses around until they went burst in 1973. So what goes before STC? Frankly I’ve not much ideas until I see some of my old stamps and phonecards. So how real the above are (steam and electric tram, trolley bus), it’s up to our imagination as I’ve not seen them personally. But thanks to the internet, much infos about our past can be dug out.